Most of the textual information presented here is drawn from the magnificent book by Irwin M. Brodo, Sylvia Duran Sharnoff, and Stephen Sharnoff, Lichens of North America, 2001, Yale University Press, New Haven. 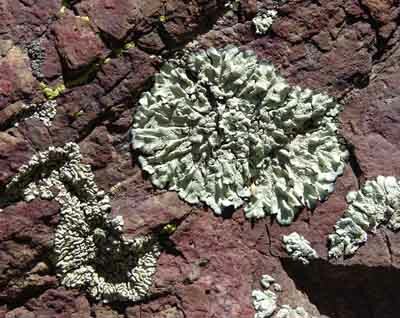 Lichens cannot be given a single taxonomic designation. They are unique in that they are a composite life form: a fungus living in symbiosis with a photosynthesizing organism, which may be a green algae or a cyanobacteria, or both. 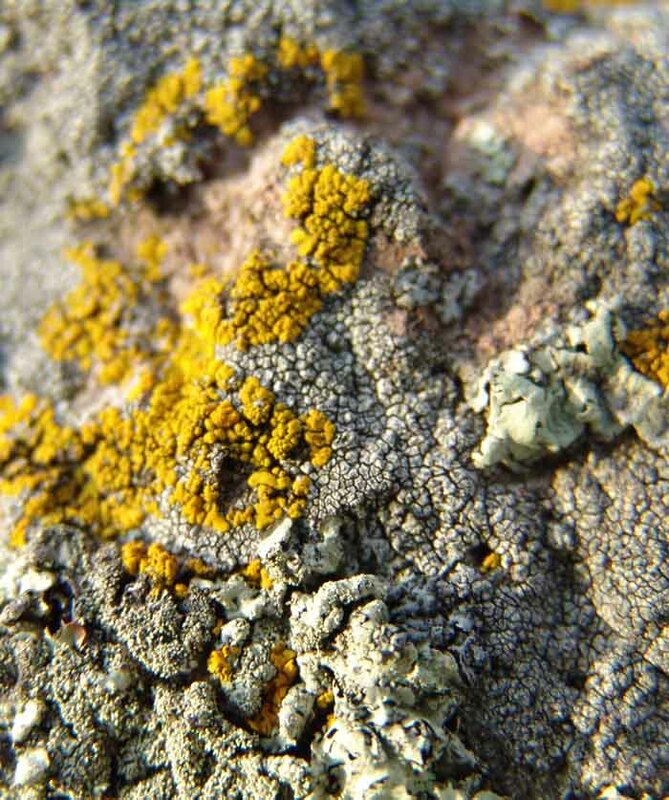 This combination has been so successful that nearly 14,000 species of lichens are known to exist, ranging globally from pole to pole and on every type of land surface. Fungi form a kingdom distinct from “true plants” in that they lack chlorophyll and thus must find food as animals do, accomplishing this either by living on dead organic materials or on living organisms as parasites. Familiar types of fungi include mushrooms, yeasts, rusts, blights, and ringworm.) Lichen-forming fungi are mostly “sac fungi” (named after the sacs that contain their reproductive spores), but enough unrelated fungi engage in lichen formation that lichens cannot be traced to a single ancestry -- their unity as a type derives from their mode of nutrition: Lichens are “fungi that have discovered agriculture." 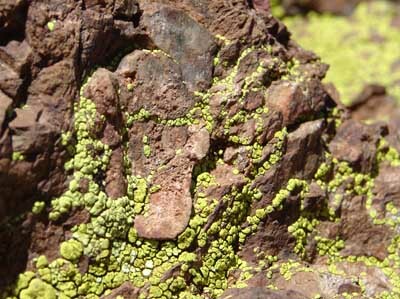 Those kinds of algae that combine with fungi to form lichens, mostly green algae, but including some gold, one brown, and a number of cyanobacteria, are known as photobionts, only a few of which have been identified to the species level (because these algae are much changed by the process of lichen-formation). 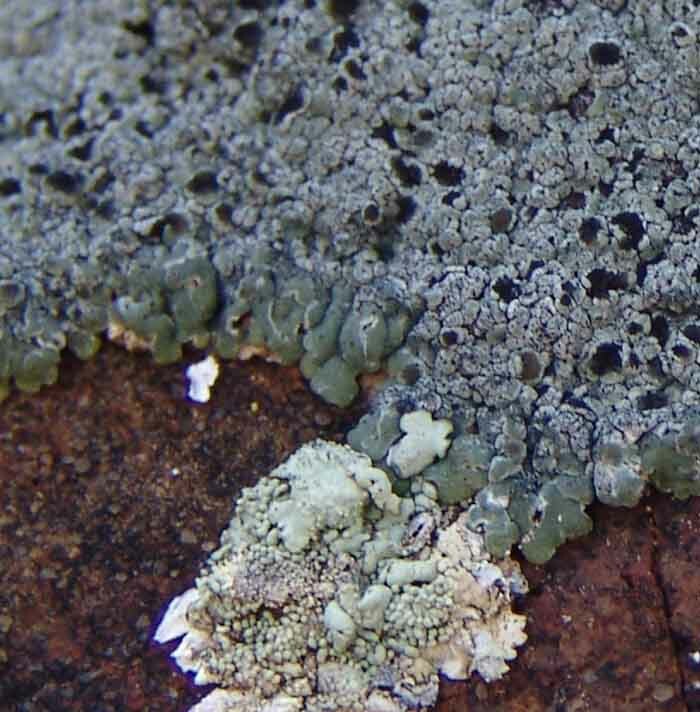 The green algaes generally form a grassy green layer in the lichen, while the cyanobacteria form a dark blue-green or blue-gray layer (or are in lichens that are almost black and jelly-like when wet). Green algae are “Protoctista” -- literally, “the very first” of the eukaryotes (organisms whose cells contain nuclei, including, in green algae, chloroplasts) but ones which do not reproduce by producing embryos or spores, and which can only exist in a watery environment. Cyanobacteria are “Monera”, an entirely different living kingdom whose cells lack a well-defined nucleus (are prokaryotes) and whose chlorophyll is spread throughout the cell fluid. The Monera kingdom is among the oldest living forms on earth, after the simplest bacteria. A lichen-forming fungus controls the process of association with its algae (and it may “choose” different kinds of algae in different parts of its range, though typically a given species has the same fungus and algae combination). This association is basically parasitic (the algae are to some extent transformed and even killed by the fungus, which absorbs carbohydrates produced by the algae’s photosynthesis), but the fungus also protects the algae from excess light, spreads their surface area, and provides a steadied supply of water without which the algae would die, so “symbiosis” is the typical, stabilized form of their association. Click on the image at right to enlarge it. 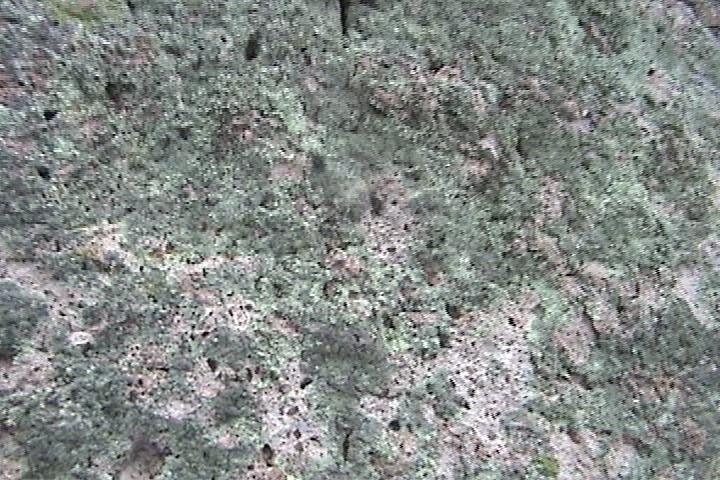 Lichen colors vary widely due to presence or absence of special pigments, though in the absence of these, lichens are generally gray or greenish gray. 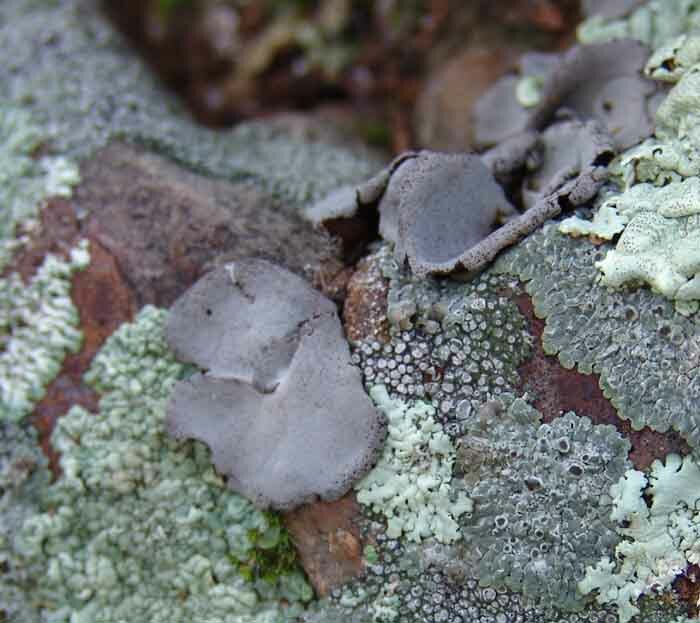 When a lichen is wet, the cortex becomes more transparent and the underlying photobiont layer becomes visible, making a gray or brown lichen turn bright green or olive in color. 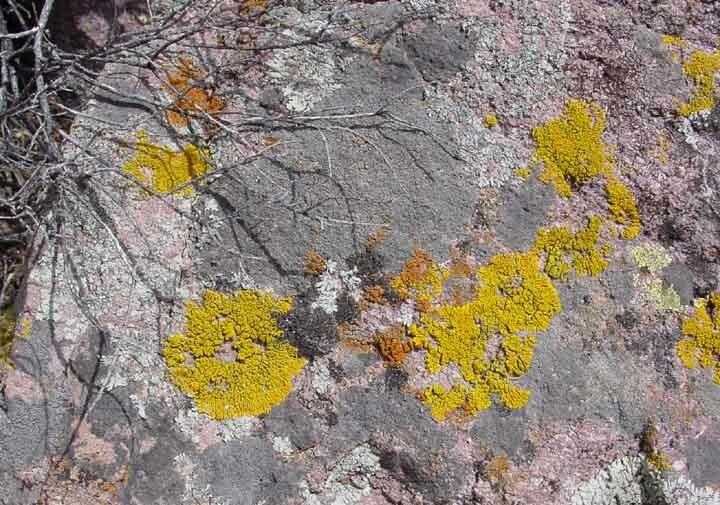 But a variety of bright pigments may be deposited in the cortex: most widespread is pale yellow usnic acid, but other pigments generate a variety of yellow, orange, or red lichens. Colors vary within species due to light exposure, genetics, age, etc. Light seems to be a primary factor, since the deepest pigments -- yellow, orange, red, even brown -- occur in the most exposed, often dry habitats. These pigments appear to protect the underlying photobionts from excessive ultraviolet radiation. 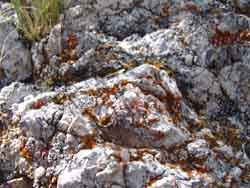 For example, consider The Yellow Cliffs in Hot Springs Canyon -- which are so-colored by virtue of their lichen cover. 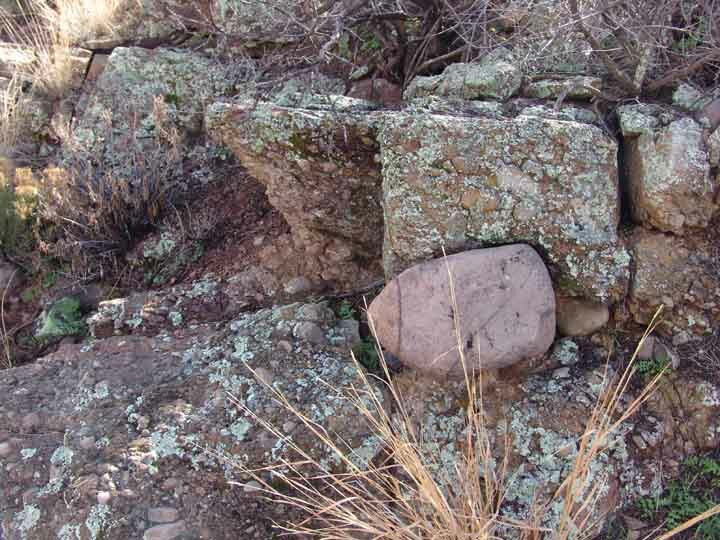 Tom Orum noticed an interesting fact, when we were examining a lichen-covered boulder that had eroded from these cliffs: This boulder, below left, was located in a rather sheltered place in the lower portion of the SE-running side wash just below the Yellow Cliffs. 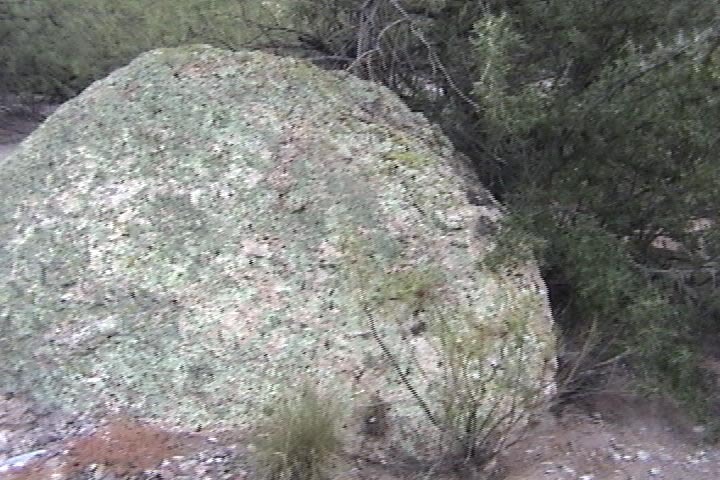 But Tom noticed that the North-facing side of the boulder, in the middle picture, had entirely blue-gray lichens, while the South-facing side -- the picture on the Right, had a mix of lichen-types that was mostly burnt-red or chartreuse in color, with a minority of blue-gray. Click on each image to enlarge it. Lichens grow through a balance of photosynthesis and respiration. They lose water and dry out very quickly (unlike some waxy leafy plants), but they also absorb moisture through all surfaces, and some do so entirely through the air in the form of fog and dew. Most are highly drought-resistant (though aquatic species are less so than those of dry climates). 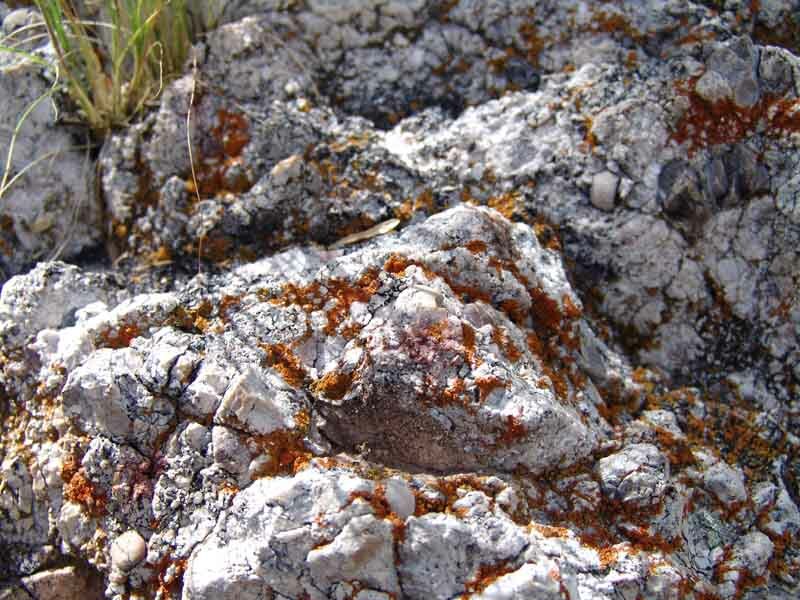 Lichens survive extreme temperatures, living in both the coldest and hottest places on earth (though not the same species!). They survive such extremes in the dry state -- if wet under high heat, they can be cooked and die. They are the dominant vegetation forms in some of the hottest deserts and the coldest polar zones (where other vegetation cannot exist). The fastest-growing types occur in foggy or rainy coastal forests. 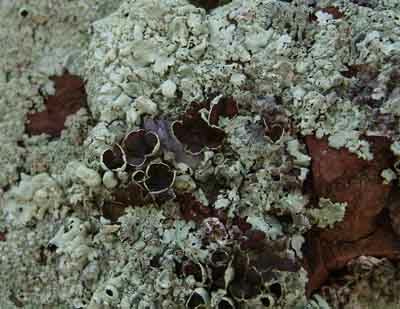 Lichens do best in abundant moisture and light but moderate temperatures (high photosynthesis, low respiration) -- mainly coastal regions, canopies of cloud forests, and some coastal fog deserts -- but even here (as elsewhere) they are restricted to substrates that allow them to compete with faster-growing plants. They do best where respiration is kept low (cool latitudes or mountains), and dark pigments adapt them to absorb heat in many arctic or alpine environments. Lichens come in such a wide array of forms -- from nine-foot looping necklace-like strands, to tiny bushes or fruit-tree-like outgrowths, as well as the more familiar crust- or leaf-like shapes (and many other shapes) -- that it is difficult to describe them in a general way. For convenience and description, they may be divided into leafy, crusty, scaly, and shrubby types -- though forms exist which are intermediates among them. 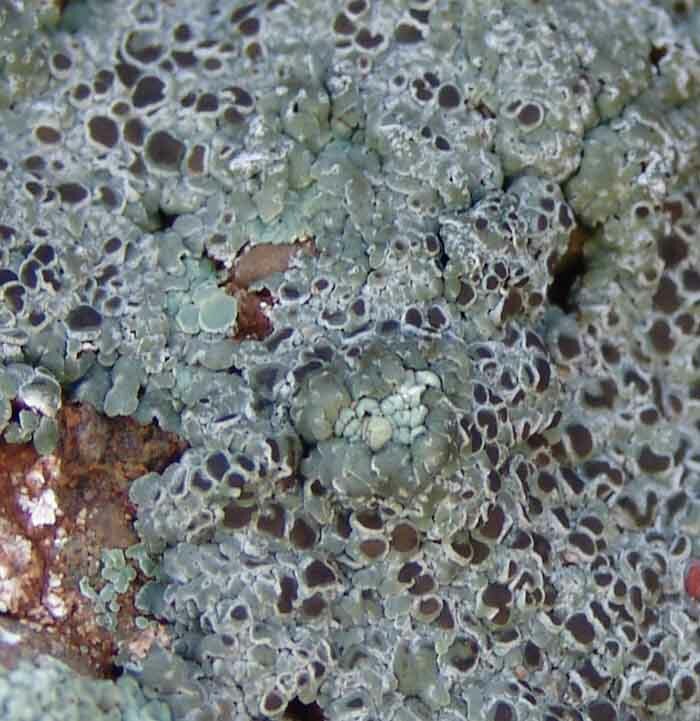 “Leafy” lichens have a rather flattened body with easily distinguished upper and lower surfaces, showing a “leaflike” form. The lichen is attached to a surface (“substrate”) by filaments, or by a single “umbilicus” ("holdfast"). 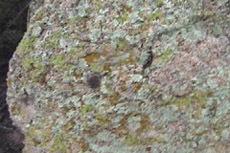 In the image at left, the roundish, blue-grey lichen just below left-center fits this category, and it also shows evidence of the "umbilicus" at the center in the form of a slight circular indentation. 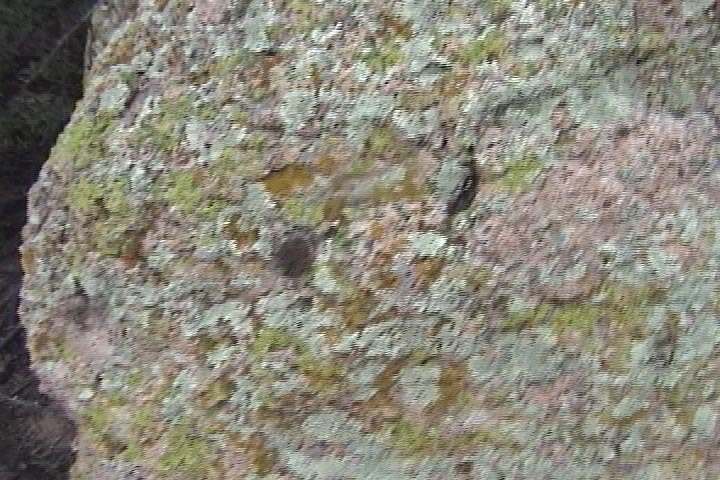 The lichens at right-center are also "leafy". 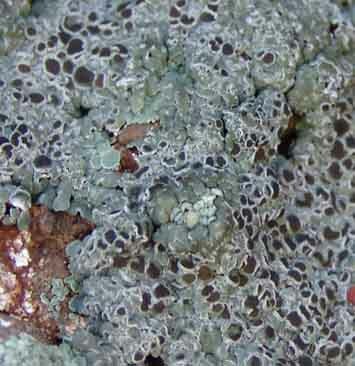 “Crusty” lichens simply form crusts over their substrates, without distinctive lower surfaces. Some are composed entirely of grains of varying sizes. They can be smooth and continuous over a surface, or broken up by cracks, or divided into “areoles” -- separate small spots. These below were photographed in lower Sierra Blanca Canyon Wash in September 2006 on Willow Canyon Formation Conglomerate. 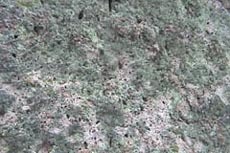 “Scaly” lichens are intermediate between the Leafy and Crusty types: a few to hundreds of small scales, attached to the substrate like shingles or patches. “Shrubby” lichens either grow erect or are pendant, some highly branched and looking shrub-like, others are unbranched filaments. Attachment to the substrate surface varies from possessing a strong holdfast to merely being draped over a tree branch or wire. Some of these look like hanging "moss", others have upright bulbulous forms. 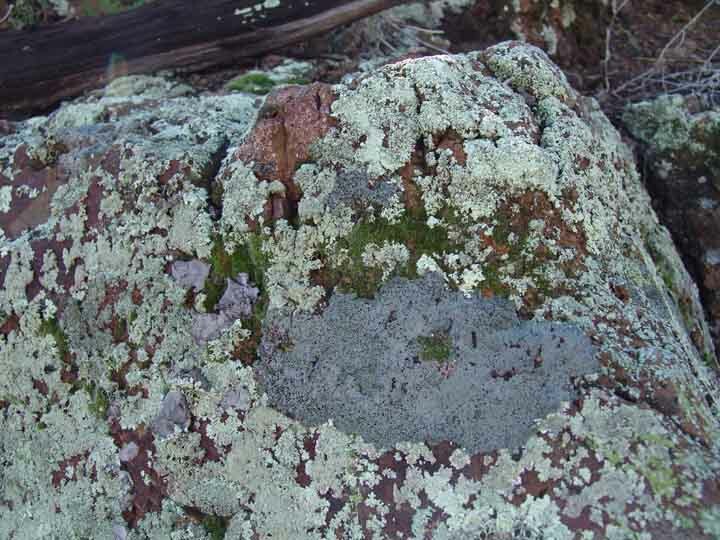 This rock shows a mix of dark green mosses with a variety of grayish lichens, but note particularly the extensive bluish one at low center: Below left, note the blue-green boundaries of this expanding lichen, now thick with water (photo taken in January 2005, after rains), and the contrasting blue-gray body with spots of dark cups. Below right, toward the center of the mass, see the swelling buds. 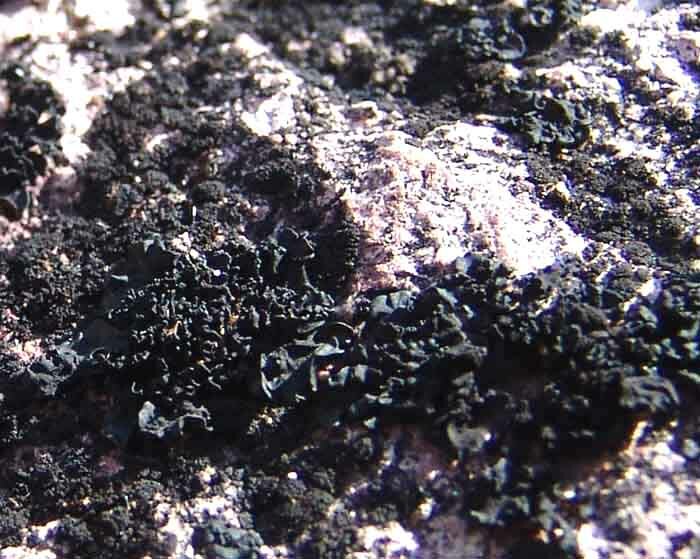 The dark cups are fruiting bodies, called "Apothecia", which contain spore bodies. Click on each image to enlarge it. 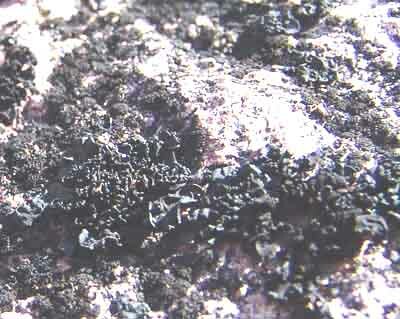 At right, gray scaly lichens on the same rock have formed more prominent Apothecia. Click on the image to enlarge it. The Waterfall rocks in Cottonwood Seeps Wash provide a wide range of angles and exposures, and present some of our most spectacular lichen formations, for example, below (taken in March 2002) -- except for the pale pink colors, nearly all of this rock is lichen-colored, from pale gray to dark gray, blackish, bright yellow and burnt orange.